Thursday August 30, 2018 - The Leader of South Africa’s Economic Freedom Fighters party, Julius Malema, has attacked President Uhuru Kenyatta for meeting United States President Donald Trump. On Monday, Uhuru who was accompanied by senior Kenyan Government officials met Trump at White House, where they discussed issues of trade and signed bilateral agreements that will help the two countries. During the meeting, Uhuru and Trump signed a financial deal worth Sh 360 billion where a US company was granted a tender to construct a 500 kilometre Super Highway that will connect Nairobi to the Coastal city of Mombasa. However, speaking on Wednesday, Malema described Uhuru as a puppet of United States. “Kenya, of course, is a something different, I don’t think there is a total independence there… America has is got a huge interest in that arrangement of Kenya,” Malema said with regard to our politics. 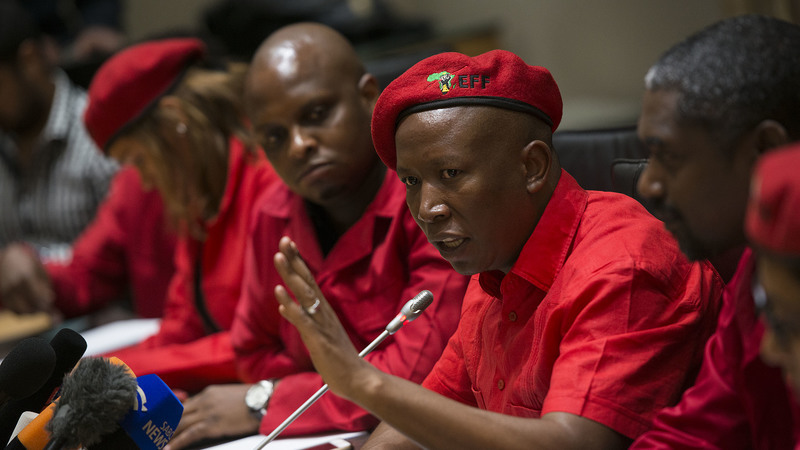 “But everywhere else in the continent we need to start doing away with those things,” Malema said referring to colonial wigs won by our Judges. Then hhy wear that western beret then mr smarts? Put on something more African; say like pig tusks, goat skins and some rattling cowries as you dance you political jig down south. Duh! Focus on your Xenophobic a-hole of a country and leave our prezo alone, you feel me? When you dumbos in the south were still in the fight for independence we had long cleaned house here way before you even became a spermatozoa. You need to learn to respect your seniors kijana. Where is KOT when you need them to blast this useless bigot back to the veld to look after goats. Trump should stop supporting white south africans on black land. Uhuru should therefore view themselves as black and not whites.even if they took land they will never be whites.